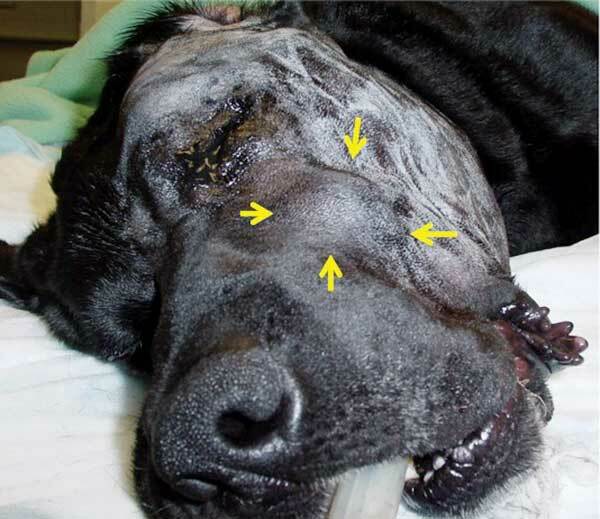 Figure 1: Intraoral view of a histologically low-grade, biologically high-grade fibrosarcoma in a middle-aged Labrador retriever. When I was in veterinary school, my naïve impression of the process for obtaining a histopathologic diagnosis of tumors was this: fix the specimen in formalin, section and stain the tumor, look into the microscope, and obtain a definitive diagnosis. I’m sure pathologists wish it were so straightforward! Over the past 20 years, I’ve learned how important it is to provide as much information to the pathologist as possible, including accurate history, location, measurements, progression if known, presence or absence of ulceration, pigmentation, and degree of firmness. Sometimes, I also send photos and imaging information to the pathologist. The more information you can provide, the greater the likelihood of an accurate diagnosis. Certain oral tumors can make the pathologist’s job a difficult one. Many oral tumors can give pathologists fits due to their similar appearance to other tumors and even to non-neoplastic tissue. Some tumors may look no different than the histopathologic appearance of scar tissue! A great example of this is the histologically low-grade, biologically high-grade fibrosarcoma (a.k.a. the so-called high-low FSA) seen in dogs. In my experience, these are more common in large-breed dogs and more commonly found on the maxilla than the mandible. The high-low FSA may be misdiagnosed as a fibroma or a low-grade FSA even with submission of a large piece of tissue due to the tumor’s well-differentiated nature and bland appearance under the microscope. 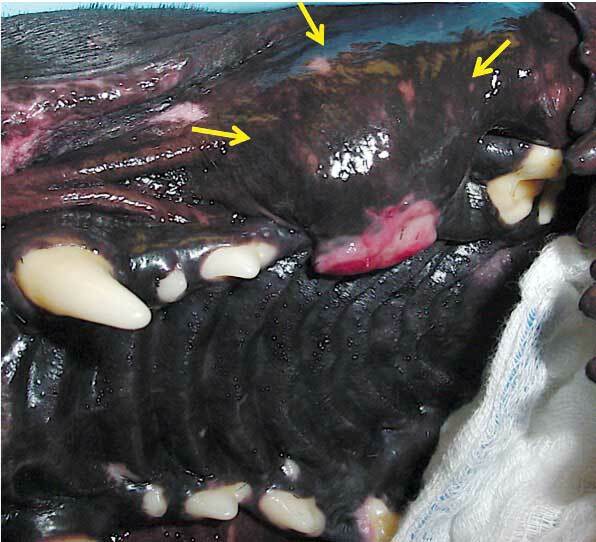 Figure 2: Extraoral view of the affected left maxilla of the dog with a histologically low-grade, biologically high-grade fibrosarcoma. Despite its bland histologic appearance, treatment of the high-low FSA must be aggressive, especially in cases of rapid growth or bone invasion. At its site of origin, the FSA is infiltrative and diffuse, and has difficult to discern tumor borders. Even when using advanced diagnostics, it is challenging to determine the full extent of the tumor. Therefore, radical surgery usually is required if the surgery is of curative intent. Ace is a middle-aged Labrador retriever that was presented to his primary care veterinarian for facial swelling in the area of a fractured left maxillary fourth premolar tooth (tooth 208). Nine times out of 10, swelling dorsal to a fractured maxillary fourth premolar tooth will be due to endodontic disease of the traumatized tooth, so it was not unreasonable for Ace’s referring veterinarian to extract tooth 208 and expect full resolution. Figure 3: Photograph of the maxillectomy site prior to closure. Note that skin was removed to achieve margins in all dimensions. However, in Ace’s case, the swelling did not resolve with extraction of the fractured tooth. A diffuse, firm swelling persisted. It is notable that in most of these cases, the original swelling is not responsive to antibiotics. Historical response to antibiotics should be discussed with the client and referring veterinarian, as this information can be a helpful diagnostic tool to see if the swelling is truly being caused by endodontic disease. While on antibiotics, facial swelling due to an abscessed tooth will resolve. However, recurrence of facial swelling is likely after discontinuation of the antibiotics, as bacteria within the canals of the diseased tooth are not exposed to antibiotics. A central blood supply is not present in an endodontically diseased nonvital tooth. The cause of Ace’s swelling was due to a neoplastic process. Biopsy was done weeks after the extraction due to lack of resolution of the swelling. The swelling was firm and diffusely involving the gingiva and mucosa dorsal to missing tooth 208 (Figure 1). The incisional biopsy showed a histologically low-grade, biologically high-grade FSA. Options were discussed, and the owner opted for advanced imaging, and based on computed tomography (CT) scan results, radical maxillectomy if there was a potential for obtaining clean margins. 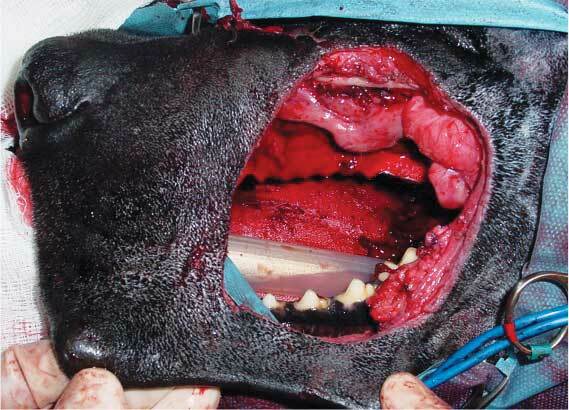 Figure 4: Intraoral closure of the maxillectomy site was accomplished using remaining lip mucosa, and extraoral closure was achieved using a rotation flap from the neck. The CT scan showed some bony lysis in the area of missing tooth 208, but the majority of the tumor was lateral to the bone, just beneath the mucosa and skin of the left mid to caudal maxilla. 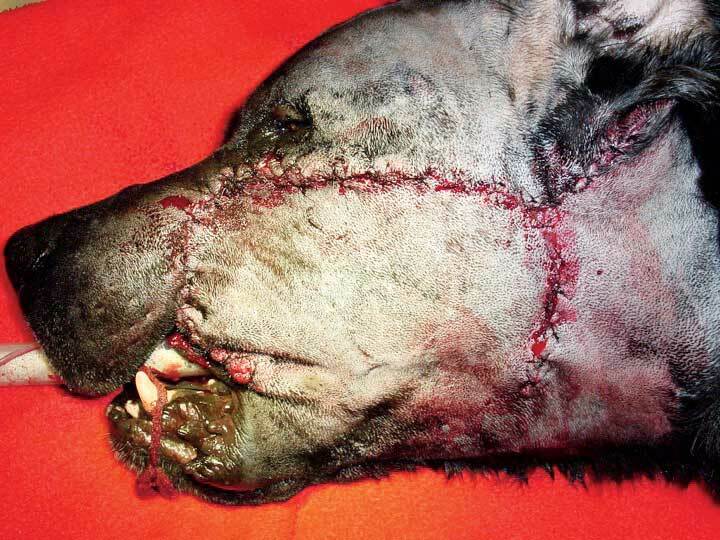 The owners opted to pursue surgery, so Ace’s fur was clipped and the site was prepped using sterile technique (Figure 2). A maxillectomy was performed that extended to midline medially and included all teeth from the left maxillary canine tooth (tooth 204) caudally to the level of the caudal hard palate and tooth 210 (Figure 3). The intraoral portion of the surgical defect was closed using the remaining strip of left upper lip mucosa. The extraoral portion of the defect was closed by raising a rotation flap of skin from the neck region (Figure 4). After demineralization of the specimen, histopathologic margins were determined to be free of tumor cells. Ace did require additional surgery to close an oronasal defect at the maxillectomy site. The owner opted for no additional adjunctive treatment for the fibrosarcoma, and at last communication, he showed no evidence of local recurrence. The take home point from this month’s column: If you receive a biopsy result that just doesn’t jive with your clinical suspicion, contact your pathologist and ask if histologically low-grade, biologically high-grade FSA might be playing a role. Surgical efforts for maxillofacial FSA should be aggressive if a cure is to be achieved. 1 Ciekot PA, Powers BE, Withrow SJ, Straw RC, Ogilvie GK, LaRue SM. Histologically low-grade, yet biologically high-grade, fibrosarcomas of the mandible and maxilla in dogs: 25 cases (1982-1991). J Am Vet Med Assoc. 1994; 204(4): 610-615.